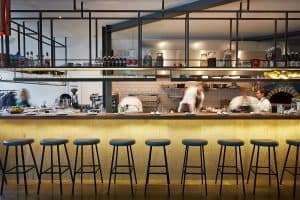 The City of London is surprisingly full of American-styled bars and restaurants, serving all manners of delicious burgers, waffles, smoked meats and classic cocktails. Here are our faves. The Super Bowl is creeping up on us, bringing with it a new wave of love and appreciation for London’s US-styled bars and restaurants. These spots dish out some of the best burgers, hot dogs, fried chicken and Southern-style smoked meats in the City. Best served with a big side of cheesy jalapeno fries, of course. But there’s also a more elegant side to American dining and drinking. Who knew? In these classier joints, you’ll enjoy classic cocktails and crustless club sandwiches while being enveloped by massive leather arm chairs. Follow this list to find the biggest eating and drinking hits that the Americans have brought over to the Square Mile. The Fat Bear, located right by St Paul’s, brings together all the best bits from each of the US’s main foodie regions. Upstate New York-style buffalo wings are served alongside classic Southern gumbo and fried chicken and waffles. Because, why not? We recommend you get a big assortment of meals for the table and share. Dig in and get messy, then wash it all down with some American bourbon and rye. Boondocks is a great take on the traditional American diner. Tuck into fat greasy burgers with a side of hand cut onion rings and foamy milkshake (either boozy or not). It’s proper home-style American cooking complete with all the flavour but without too much fuss. It’s right by Old Street so is full of all the usual suspects; businessmen, tourists and the occasional hipster who has strayed down from Dalston. It’s where to head for hearty food in a fun and upbeat environment. 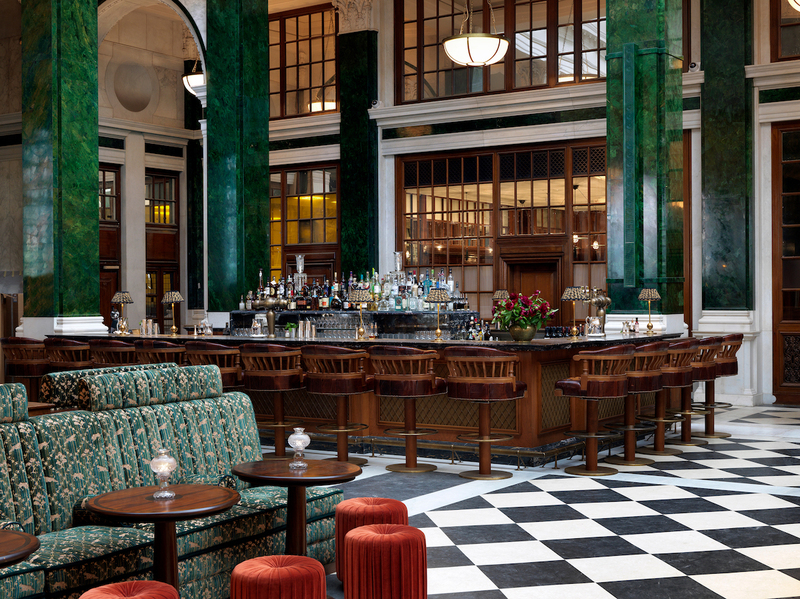 As you’d expect of any restaurant and bar within the Ned, The Nickel Bar is both grand and extravagant. Gawk at the high vaulted ceilings, deep green marble columns, long leather banquettes, and its very own circular raised stage for all kinds of jazzy musical performances throughout the day and night. The food and drink offerings are simple and refined, a great contrast to the opulent space. Voted the best bar in the world in 2017, the American Bar at The Savoy is the place to be for any cocktail aficionado. The art deco interior takes guests back in time to the roaring ’20s while the cocktails are a mixture of both classics and approachable modern concoctions – all made with top shelf liquor. Perch at the bar with legendary bartenders and sway about while listening to enchanting tunes from the local jazz pianist. It’s an American Dream. It’s Carnivores only at Meat Mission. Well, based in Shoreditch they do have vegan and vegetarian friendly items, but punters certainly come here for some kind of meat with a side of chilli cheesy fries. And the setting is pretty cool as well: the restaurant and bar have been constructed to look like an old American mission with stained-glass windows on the ceiling and reclaimed wooden tables scattered about the room. It’s a bit over the top but stays right away from tacky. Decked out to look like an old school Southern American smokehouse, this Shoreditch restaurant’s smoked meats are just about as close as you’ll get to their counterparts in Texas and Tennessee. Order the beef brisket, the pork belly ribs and the roasted aubergine before surrounding them with all manners of sides. You can even pre-order a full beef brisket the day before if you really feel like treating yourself to some proper Southern American cuisine. 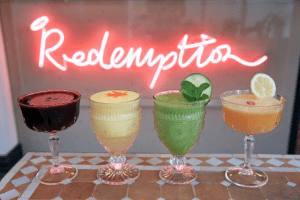 This New York-inspired bar and restaurant in Shoreditch is located in an old Grade II-listed heritage building brimming with character. It makes for the perfect location for a fun and quirky American dining joint. 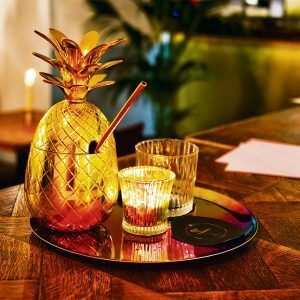 Expect to find bottomless cocktail brunch on weekends and four-hour long happy hours every weekday, during which you can grab some thirst-quenching £5 cocktails. Dirty Bones’ American comfort food is the perfect pairing for a boozy night out. Tuck into cheeseburger dumplings, spicy buffalo wings, tacos, mac ’n’ cheese and heavenly cheesy truffle fries – they’ve got the lot. Pitt Cue had humble beginnings as a food truck on the Southbank before eventually moving to their current bricks and mortar location in Devonshire Square. Now they’ve got a proper big kitchen, smashing out all kinds of delicious smoked meats and vegetables. And for a special bonus, they’ve even got their own brewery on site. This menu is a bit more international but maintains a whole heap of influences from across the pond. This is especially true when it comes to their massive charcoal oven, spitting out all kinds of steak, lamb chops and spiced chicken. They’re also one of the few spots in London celebrating Thanksgiving with a traditional holiday menu. They’ve got roast turkey with all the trimmings, squash soup, plus pecan and pumpkin pie, so be sure to save room for dessert.